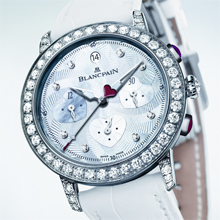 Faithful to its annual rendezvous, Blancpain once again presents an exclusive creation for Valentine’s Day. 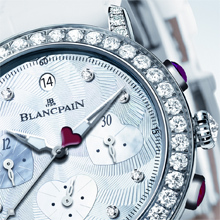 This limited series of 14 watches, each set with 2.95 carats of precious stones, offers a fresh take on the refined aesthetics of the Blancpain Women collection, while associating it with the technical subtlety of the flyback chronograph. With its diamond-set bezel and lugs, caseband set with four diamonds and a heart-shaped ruby, crown adorned with a diamond and pushpieces covered with cabochon-cut rubies, the white gold case of this Saint-Valentin Chronograph 2012 sparkles with dazzling splendour. Its engraved mother-of-pearl dial, featuring a marquetry-work motif composed of three white mother-of-pearl hearts and set with 8 diamonds, highlights the exquisite craftsmanship of the master-dialmakers of the Manufacture. In an additional nod to Cupid, the heart-shaped counterweight of the central sweep seconds hand is delicately hand-painted with a feather, thus endowing it with a distinctive convex shape. The sapphire crystal back of the 36 mm case reveals the complexity of the movement with its 308 parts and 37 jewels, along with the oscillating weight clothed in pink mother-of-pearl. The Saint-Valentin Chronograph 2012 houses the self-winding Calibre F185 that drove the very first ladies’ flyback chronograph model. It features central hour and minute hands, seconds shown on a subdial at 6 o’clock and the date appearing through an oval aperture at 12 o’clock. The chronograph function is displayed by a central sweep seconds hand, while the elapsed minutes and hours are counted off on totalizers at 3 and 9 o’clock. Two pushpieces serve to control the measurements: the first at 2 o’clock starts and stops the chronograph, while the other at 4 o’clock handles the flyback function. A single press on the latter pushpiece stops measurement of the first time interval and resets the hands to zero, and the timing begins again as soon as the pushpiece is released. This delightful model, fitted with a white alligator leather strap and presented in a precious wooden box delicately lined with white nappa leather, is available exclusively from Blancpain boutiques.